The Peculiar Journey | Walking with God, one word at a time. Walking with God, one word at a time. Thank you, Lord, for not giving up on me. Thank you for mercy. Thank you for seeing purpose in me even when I can only see pain and brokenness. How many times have you mended me? How many times will you heal me still? You never give up. You never will. How amazing if that? Speak, for I am listening. Lead, for I am following. In the Night, His Will Reigns. Sometimes, the world feels like it’s falling apart, but, at ALL times, He has a plan, He is working wonders, and He is with me; therefore, I surrender my expectations to the will of my Father, the only one who knows my tomorrow, the one who has written my future, the one who holds me safely in His hand. These last few weeks have been rough for me. I’ve been struggling with my depression, combating the stress of school, wrestling with inner doubts and questions, and, to top it all off, I have the flu. Go figure, right? Thanks to medication (Thank the Lord for Tamiflu!) and lots of self-care, I was finally reviving into a functional human being. And then, my mom called and dropped a bomb on me that shook everything. Any answer means He heard my cry and recognized my need for an immediate reply. This song is a reminder to me that He has a greater plan than any I could begin to imagine. Through this song,God reminded me where my faith should be: in His will. His will is greater than my own. My will only seeks the snapshot of life I can visualize. His will serves the biggest picture that serves us all. Verse Two. All of it. Life doesn’t always feel good, and it’s hard to “count it all joy” when it doesn’t, but God is always good because God is always God. This “night” may last days or weeks or years in our eyes, but I believe in the morning He has promised. I will not lose hope for I know the One whom I call Saviour, Redeemer, Master, and King. You’d think speaking to God would be easier. I mean, He already knows what you’re going to say, right? So, why is praying so difficult? You know what I think? I think I find praying difficult because I have a tendency to get caught up in trying to use just the right words. I’m a writer and a perfectionist, so I fall into that trap ALL THE TIME when I write, but I never really thought about how similarly I treat praying. See, when I get stuck on a word, I get S-T-U-C-K… or, at least, I used to. I’ve gotten better about saying, “Never mind, just get the idea down. That’s the important part.” Did you notice what happened? My focus shifted. I went from focusing on saying everything perfectly to focusing on saying what I needed to say in whatever words came first. I finally realized the PURPOSE was far more important than the method. Guess what? The same principle applies to praying! God doesn’t care if we use big, frilly language that sounds like it came out of a poet’s pen or if you say, “Hey, God, I love you. I need your help with _____. I’m giving it to You. Do Your thing. You da best!” Now, that last part is not how I pray but not because it’s wrong. That’s just not how I talk. So, why’d I include it as an example? Simple: I have had campers pray a very similar prayers. God loved those campers’ prayer just as much He loves the fancy prayers we’re all so accustomed to; He may have even enjoyed it more for its honesty. The point is God wants to hear from you, and I mean the real you. He is everything and everyone you need. He is your God, your personal God. You don’t have to hide anything from Him, and you definitely don’t need to make yourself or your speech up to impress Him. He knows you. He loves you – just as you are. Say what you mean in words you understand and feel comfortable saying. Just talk to Him. He’s listening. He’s waiting to talk to you, too. To be honest, I haven’t been feeling much like myself lately. I’m falling back into a depressive slump, and I don’t like it, but I don’t know what to do to fix it. Of course, I don’t have to know. Why? Because me knowing is all about “me, me, me” when it’s not about me at all; I should be focused on “Him, Him, Him.” That’s my problem when I start stumbling. I focus on my feeling helpless, my feeling lost, and my inability to quell this monster on my own. The thing is it’s not my battle to win! If I try to destroy my depression and anxiety on my own, I will lose every time. I need to give it to Him. “. . . So to keep me from becoming proud, I was given a thorn in my flesh, a messenger from Satan to torment me and keep me from becoming proud. My depression, my anxiety – they are my thorn. I have cried out to God over and over again to remove them from me, but He refuses. He keeps sending me these verses instead, and so I will boast of this thorn in my side and use it to serve God’s glory. Through my weakness, He makes me strong. I place my trust in His will and His hand in my life, on my mind, and on my body. Yet I will rejoice the LORD! No matter what seems to be going wrong, I will rejoice in the Lord my God and trust His path for my life. The road my not be easy, but I know it will be worth taking, even with all the valleys I must walk through. The darkness will not claim my life but give me a testimony to bring others to the Light. Who can know how long the night will last, but the morning will come. I suffer this thorn in my side, for I know that I am trading my sorrow for joy, my weakness for strength, my pain for comfort, and my past for my salvation – and each of you can do the same. Your thorn may be different from mine. Your story certainly is, but God can use your testimony to serve Him, if you let Him. Don’t be ashamed of your journey; share it! Someone needs your story. Okay, I recognize that I have been seriously neglecting this blog. As you read on, you’ll see that God’s been dealing with me about just that. We get scared. We doubt – regularly. We get busy and get too focused on the craziness of our lives that we lose track of our lives with God, and we make countless excuses: “I have to get this paper done before I do anything else;” “I have too much to read; I’ll do it later;” I don’t have time to do it right now;” “Can’t afford to do fun stuff, yet;” etc. The problem is we never do it later. There is always something else that needs to get done, some important task that we think is more important at the time than a conversation. Boy, are we wrong! There is nothing more important than our relationship with God. No matter what is going on or how busy we are, we need to set aside plenty of time to build and maintain our relationship because without it everything will fall apart, and we rarely recognize the cause of our troubles. I am the poster child of this issue. I constantly get caught up with everything else in my life, especially school, and forget to – or just don’t – take the time to focus on God and spend time with Him. Inevitably, my world starts falling apart before too long. Until the last few weeks, I was still struggling to keep myself focused on my Father. I thought summer would be easier to refocus without classes, but that hasn’t been the case, so I’m challenging myself to write every day and to post a blog at least once a week. God doesn’t expect perfection. (Someone, please, keep reminding me of that.) He wants all of us: the good, the bad, AND the ugly. 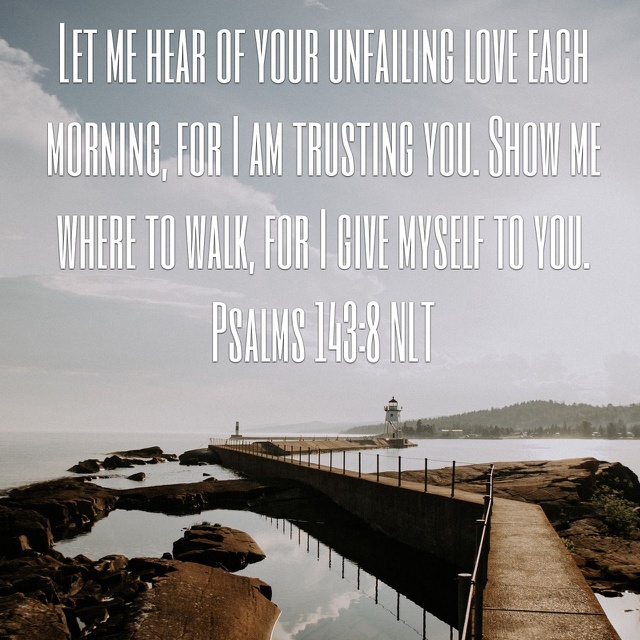 He knows everything about us and loves us anyway, so why do we act like He doesn’t want what we have to give, even if it’s not all that we probably should? God understands baby steps! Give Him what you can now, and more will come later. This is one piece of advice that I really need to remember and act on myself. Sometimes, it’s good to just be. When you keep yourself going every instant of the day, you forget to take “you” time. At first, you’re still fine without it, but eventually that lifestyle of “Go! Go! Go!” catches up to you, and you just can’t handle it. You may think “No, not me. I can handle it, but I’ll let you know right now that you’re wrong. You may be able to deal with the stress “better” and longer than others, but no one was made to be mentally, emotionally, or spiritually prepared to handle that constant movement. Something or someone always ends up forgotten or neglected. Quite often, that someone is God, and that something is our spiritual health. God did not call any of us to be constantly on the go and busy. His purpose for our lives never leaves Him out in the cold. If your plans leave Him out of the equation, it’s time to reevaluate. He’s a jealous God. He doesn’t appreciate being placed on the wayside when you chase your dreams with such force that you forget who brought you to them. Take time for yourself. Take time to breathe and experience how blessed you are. Take time to talk with your Father. He misses your conversations together. It’s okay to do the things you enjoy. It’s okay to be busy. Just don’t be so busy that you neglect the important things: family, friends, self, and – above all – God. Even when it’s hard, even when I don’t feel I can be, even when my heart is broken and my soul is hurting, I will rejoice, I will be glad, in the presence of the Lord. He is El Sheddai. He rules over every part of my life, every part of my world. The pain and the darkness may last for the night, but the joy of the Lord – MY Lord – will last forever (See Psalms 30:5). He restores my soul, and I will praise Him – through the storm, through the fire, through it all (See Psalms 23:3). It’s been a hard week for me and for my family. Tuesday morning, I lost my grandma. The possibility had been there – she had been sick – but she had been getting better, and I just wasn’t prepared. I’ve been fighting to keep myself together, and I have lost that fight and gone to pieces more than a few times. Sunday morning, I broke down during service when we sang “Wonderful Peace” because I just have not been able to find that God-given peace. I can’t understand why. I know she has finally reached her better, and I know she’d tell me not to worry because all is well now that’s she’s with the King, but the truth of the matter is that it doesn’t matter how much I know these things, I also know that the pain of her loss is still heavy on my heart regardless of how much I know. For these God-sent people, I am ever thankful. My eyes are red and raw, but I will carry on with the strength of the Lord my God, my Keeper, my Provider, my ever-present help in times of need. I’ve been debating about posting this here or elsewhere or not at all. I considered just posting it straight to Pinterest, but I realized there’s way too much to say about the process for that. 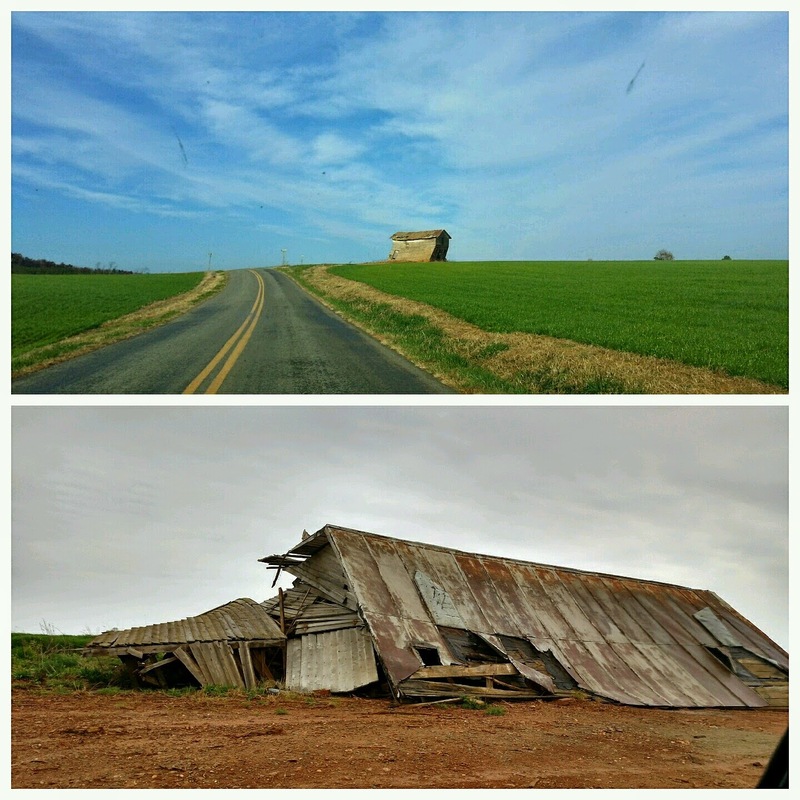 I know it’s, in done ways, incredibly off topic from what I originally created this blog for, but at the same time, this blog is supposed to be my journey, and this is certainly a part of my journey, in more ways than one. With that being said, welcome to my first crafting post! This was my anniversary gift to my boyfriend this year. I made it using odd decor items I found at Michael’s, with the exception of the E which is two wooden letters from JoAnn’s glued together and wrapped with jute. The board is from an old building on his family’s farm that finally fell last April: I printed what is probably my favorite picture of the two of us to put in the frame. It was taken at our friends’ wedding, and it’s not the one we were fully posing for. Someone made us laugh right before the picture was taken, and that makes it so much better. We laugh – a lot! It’s one of my favorite parts of our relationship, and I’m glad someone captured one of our moments. The whole idea for this project kind of came together accidentally. I started with the L, the frame, and the keys to make something for my own wall, but then, as I was messing with their arrangement, I realized they could spell “Love,” a word and concept that had been incredibly present in my life lately. I’ve found that I am absolutely surrounded with love. I have a wonderful family, a fantastic group of friends, and the most amazing and God-fearing man any girl could ask for. Then, above all that, I am loved unconditionally and unceasingly by my Awesome Father, and that’s something that constantly leaves my heart overflowing with grace, adoration, and thankfulness. While the initial point of this point was to share my crafting creation, the main point is recognizing the wonderful life I have been blessed to live. I thank God for that every day because I see time and time again the experiences and hardships of others. In times of trouble and trial, I will remember the love my God has blessed me with, both from his arms and from those He has placed in my life to love me here on earth. The last few weeks, I’ve gone completely AWOL from the blogging life. I’ve actually spent the last few weeks struggling to keep on track with any sort of writing at all. I had a few ideas for blog posts, but I let life get in the way, and those ideas never made their way out of my head and onto the keyboard. What can I say? I’m definitely an imperfect blogger and an imperfect person. Sometimes my flaws come shining through, and keeping a project consistent is one of my big ones. A lot of it comes down to a time-management issue, and I’m going to continue to work on that. So far, it’s slow going. I believe I’ll get there, though. Anyway, on to the reason I jumped back onto my keyboard to write. Let it be known that I’m a pinner. Yes, I have a Pinterest, and I use it maybe a little bit more than I should; however, it is an incredibly useful site, and I’ve been using it to keep myself together. If you’re one for awesome things and organization, Pinterest is for you! I promise it’s not all crafts and DIY projects. There’s more to Pinterest than you think! Recently, I found a blog post that I immediately pinned to my board focused on helping me draw closer to God, and I’ve been waiting for November to use the pin. The post I pinned was written by Shannon Long on her blog Sweet Blessings. 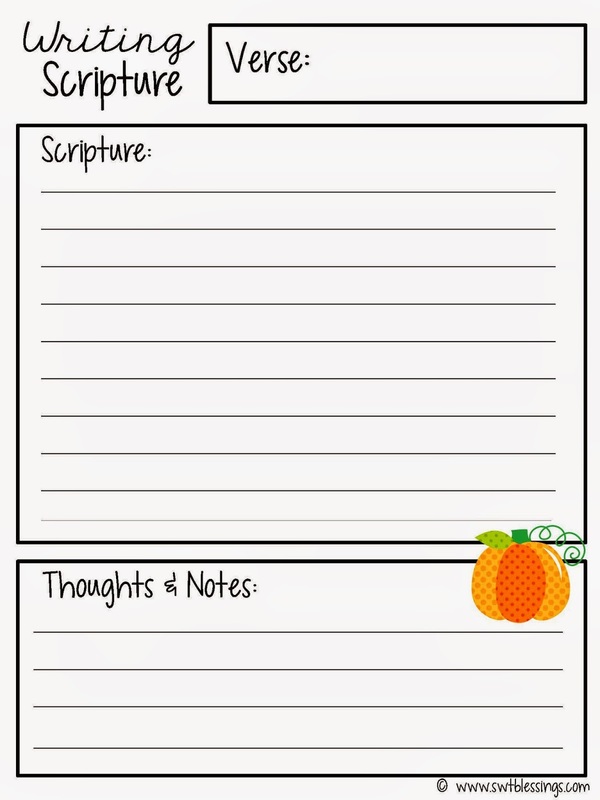 It is a “Thanksgiving Scripture Writing” plan, and I’ve beem excited to begin this plan because it is so simple and so easy to follow and stay on track. 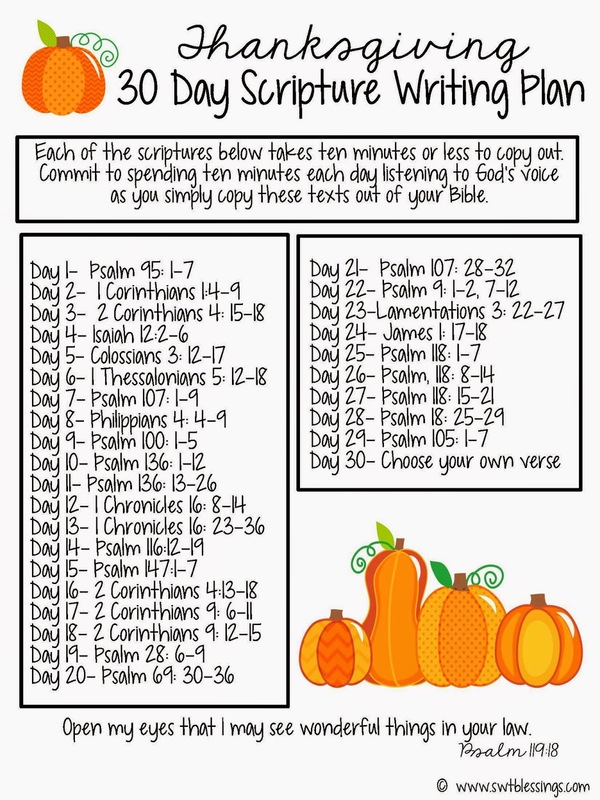 Plus, it’ll help me begin Bible journaling again. I actually printed the plan and glued it into my journal so I will always have it at the ready whenever I sit down to read that day’s scriptures. That way I won’t have to depend on my phone or my computer where I can easily get distracted from what I really want to be doing. Now, the most electronic media I may have is a quiet, worshipful music playlist, either through Pandora or my music library. Today, I chose my “Who But You (Abraham & Sarah)” station on Pandora. 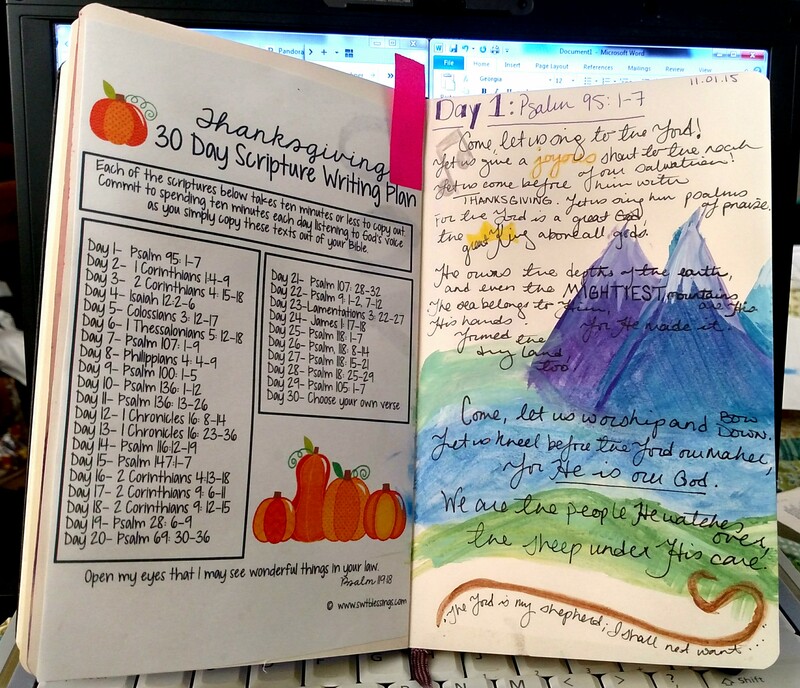 As I take part in this Thanksgiving Scripture Writing Plan, I invite you to do the same. Let’s delve deeper into God and rediscover every reason we have to be thankful for the love and blessings He has showered upon each of us. Hi! I'm Elizabeth Turney. I am a proud graduate of Virginia Tech, and I love to write. Writing is my passion. I share my life, my thoughts, and my dreams through words. With those words, I hope to share my journey. "But ye are a chosen generation, a royal priesthood, an holy nation, a peculiar people; that ye should shew forth the praises of him who hath called you out of darkness into his marvelous light;"